This smooth and sophisticated living room ottoman features a transitional style that perfectly blends with its coordinating chair. Tapered wood legs create contemporary charm with a high end upholstery and welt cord trim. Sit back and put your feet up with the laid-back comfort and classic style of this footrest ottoman. 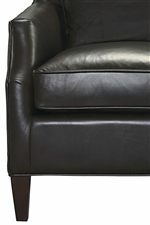 The Kent Classic Chair Ottoman by Bassett at AHFA in the area. Product availability may vary. Contact us for the most current availability on this product. The Kent collection is a great option if you are looking for furniture in the area.